Once a workspace becomes a complex series of parallel streams, it is important that you can test each stream separately, and also be aware of how changing one component can impact other sections further on in the workflow. 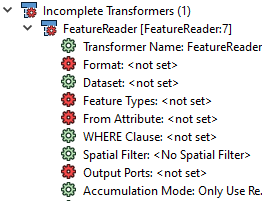 If you see an Incomplete Transformers parameter in the Navigator, it means that the workspace contains one or more transformers that need parameters filled in before the transformer will be operational. The Navigator displays a list of potential issues, and the problem parameters are shown in red. Most times, you will just need to enter or set a value, the parameter icon will change to green, and the transformer will be removed from the "Incomplete" list. Occasionally, this situation can arise when changes to one transformer cause the settings in another to become invalid. FME will automatically flag transformers when they are adversely affected by changes elsewhere. It does this by resetting the transformer properties button back to red, to indicate that attention is required. The individual setting that is causing the problem is also separately highlighted. FME takes changes into consideration for the entire workspace, not just the changed transformer.